The play enchants with an engaging discourse on religion and sexuality. The current theater trend running through the thesbian world is a reexamination and revitalization of Tennessee Williams's lesser known works. 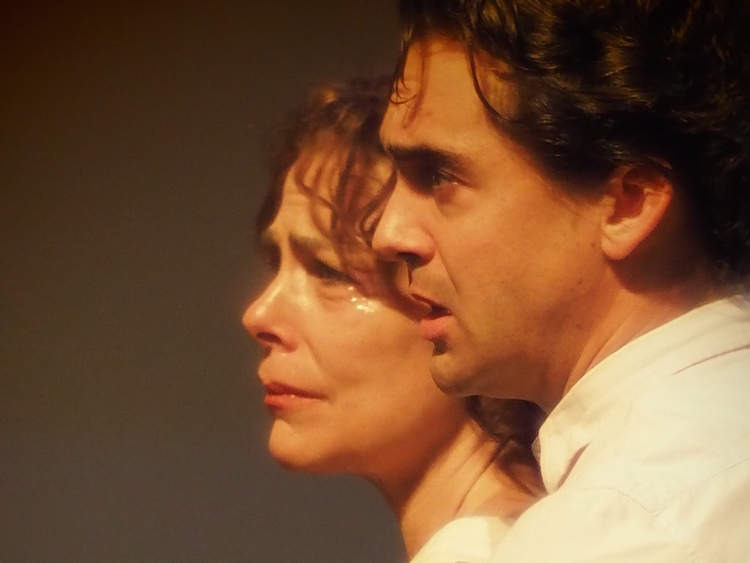 Currently, Beth Bartley and Irene Glezos, in association with the Provincetown Tennessee Williams Theater Festival, are presenting Orpheus Descending, a production that’s skillfully directed by Austin Pendleton. The play originally premiered in 1940 in Boston under the title Battle of Angels. It closed amid scandal for its controversial juxtaposition of religion and sexuality. Later, however, the play was rewritten by Williams and arrived on Broadway in 1957 as Orpheus Descending. While a critical and commercial flop, The New York Times's critic Brooks Atkinson praised the script and the play was revived on Broadway in 1989. It now returns to New York at St. John’s Lutheran Church. Leading the production as Lady Torrance, the Sicilian immigrant wife of the owner of a dry goods store, Glezos captivates the audience. She deftly conveys every layer of sorrow and anguish that envelops Lady, crafting a character whose pain is as rich as Williams’s elevated, dramatic language. As Val Xavier, Todd d’Amour charms the audience by creating an ideal mysterious and devastatingly sensual rouge nomad. He enters the play with just a guitar and snakeskin jacket, blending the eroticism of an enigmatic musician with that of raw animalism. Throughout the evening, he sheds many layers to reveal a character with a fascinating yet complicated past. The town surrounding the Torrance dry good store is a stereotypical God-fearing Southern town. Brenda Currin delights as Beulah Binnings, the ringleader of the town’s gossip mongers. Playing the girl from the wrong side of the tracks, Carol Cutrere, Beth Bartley betwitches the audience with a character who has been ostracized for owning her sexuality; her monologue about the dead urging the living to actually live is one of the evening’s most memorable moments. David Pendleton’s The Conjure Man seems like an oddity in the play, but he also serves as reminder of how othered and abused the primitive nature of man is in a deeply Christian society. Though Williams’s script rambles at points, it nevertheless establishes a world for its characters that is surprisingly cohesive. Pendleton’s direction ensures every word is mired in the emotional reality of the characters, and his omission of an intermission forces us to remain immersed in the play for the duration of the two-and-a-half-hour performance. By performing the piece in a church, the barebones set leaves a stained-glass window featuring Jesus visible to the audience, who are seated on padded pews, at all times. The play’s discourse on religion and faith are made all the more tangible, omnipresent, and haunting long after curtain call. This rare revival of Orpheus Descending runs through May 14 at St John’s Lutheran Church (81 Christopher Street). For tickets and more information, please visit www.facebook.com/orpheusinnyc.